Backdooring and re-flashing firmware images is becoming mainstream: malicious guys are infecting embedded devices and inserting trojans in order to achieve persistence. Recent articles covered the increasing number of trojanized android firmwares and routers that are being permanently modified. Attackers with a privileged network position may MITM your requests and forge fake updates containing malicious firmwares. Writing Evilgrade modules for this is really simple, as most vendors keep failing to deliver updates securely, right ASUS? I'll keep my tradition of writing posts based on CTF challenges because everybody upvotes CTF posts on reddit it's cool. The challenge "Vodka", from NoConName 2014 CTF Finals was created by @MarioVilas, who kindly provided the files here (thanks dude!). I did not participate on the CTF finals, but I found the challenge really interesting because there were many different ways to solve it, summarizing the actions needed to audit a compromised firmware. In my opinion, the best CTF challenges are the ones that require us to develop/use new techniques and improve existing tools. Description: No hints :( just get the flag. A mysterious bug affected one of the core routers at a major Internet service provider in Syria. The failure of this router caused the whole country to suddenly lose all connection to the Internet. The Syrian government recorded a traffic capture right before the crash and hired you to perform a forensic analysis. Network Miner makes it very easy for us to understand what's going on: there's some sort of file transfer via TFTP and the filename seems to be related to an OpenWRT firmware image. 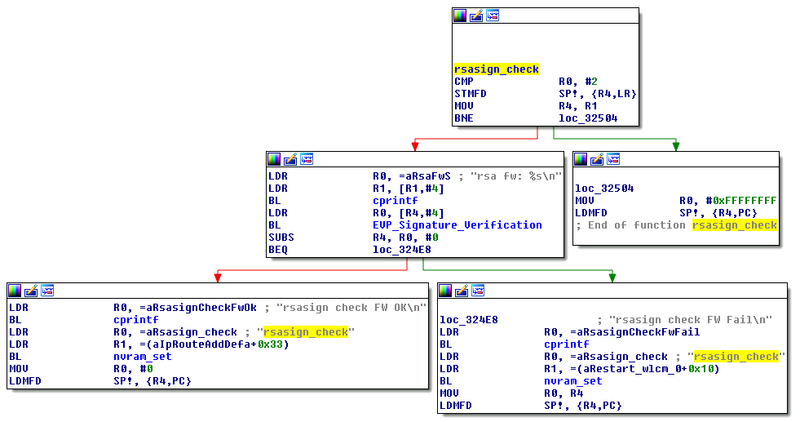 We always binwalk all the things but very few people stop to analyze and understand the firmware structure properly. We know that the firmware image was downloaded using TFTP, a common way used by many routers to transfer config files/updates and it is probably based on the OpenWRT project. So what does binwalk tell us? The Commom Firmware Environment (CFE) is a firmware interface/bootloader present on Broadcom SOCs. It is analogous to the BIOS on PC platforms and it is responsible for CPU initialization and bootstrap code on embedded processors. The CFE is also referred as PMON and it is generally mapped to mtd0. The JFFS2/NVRAM filesystem is the non-volatile partition. They store all the configuration parameters, including router settings, passwords and logs. The TRX header is just an encapsulation, describing a series of information from the firmware, including the image size, CRC, flags, version information and partition offsets. Binwalk wasn't recognizing the header and the relative offsets properly so I submitted these two pull requests. Creating custom signatures for binwalk is pretty straightforward. Some firmwares (like the newer ones from ASUS and Netgear) use this TRX structure but don't include a loader: the Linux Kernel and the RootFS may be shifted on this occasion. This extra header appears on a few routers like the WRT54G series: the Web GUI checks for this pattern before actually writing the firmware. According to OpenWRT Wiki, the boot loader has no concept of filesystems: it assumes that the start of the TRX data section is executable code. The boot loader boots into an LZMA program which decompresses the kernel into RAM and executes it. It turns out the boot loader does know gzip compression, so we have a gzip-compressed LZMA decompression program at 0x3C. You can find the source code for this lzma-loader here and here. Note the TEXT_START offset at 0x80001000: we may need to adjust the Loading Address on our Disassembler in order to reverse the compiled loader. Don't forget to decompress it (gunzip) before reversing the file. Note that if we modify the loader to include a backdoor, we would have our very own Router Bootkit, cool isn't it? Instead of just putting a kernel directly onto flash, most embedded devices compress the kernel using LZMA. The boot loader boots into an LZMA program which decompresses the kernel into RAM and executes it. Did you notice the compile date was 03-February-2007? Let's save that for later as well. The last part is the actual filesystem. Most embedded Linux devices use SquashFS and many vendors hack it in order to get better compression and faster performance. Hopefully we don't have to worry about that as Sasquatch handles different SquashFS header/compression formats. The filesystem has the standard OpenWRT directories and files, including a banner from the 0.9 build (White Russian). Now that we have unpacked & unsquashed the firmware, let's use binwally to compare the directory tree and find the needle in the haystack. 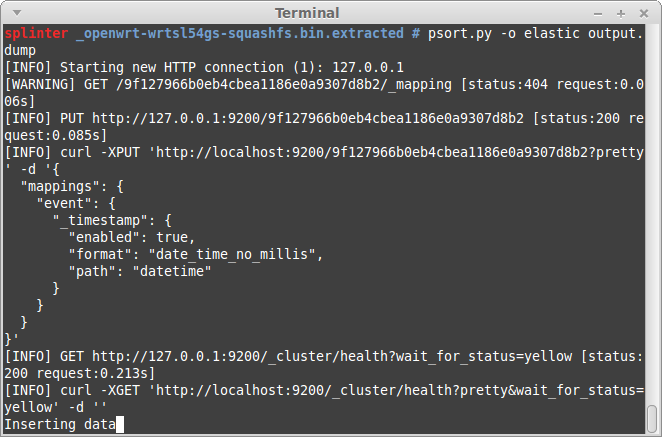 binwally.py ctf/_openwrt-wrtsl54gs-squashfs.bin.extracted/ micro/_openwrt-wrtsl54gs-squashfs.bin.extracted/ | grep -E -v "ignored|matches"
After carefully reviewing these files, we notice that the "/etc/profile" was modified to include a call to the nc backdoor. 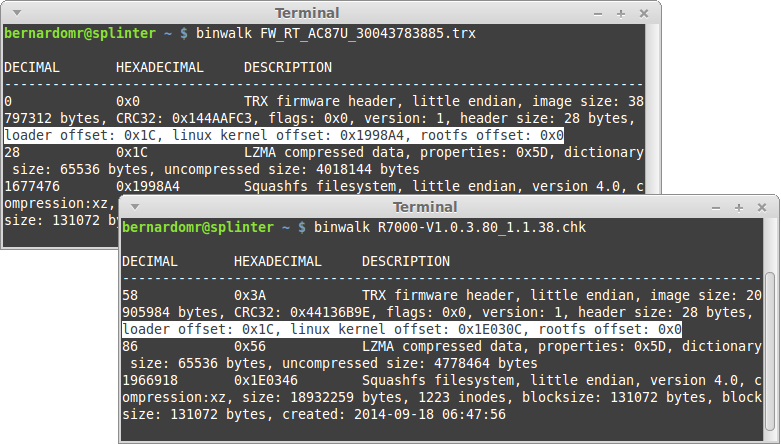 The LZMA'd Kernel (offset 0x8F8) is the same on both images, even though binwally reports a difference. This happens because binwalk extraction doesn't know when to stop and both files also contain additional data like the SquashFS partition. 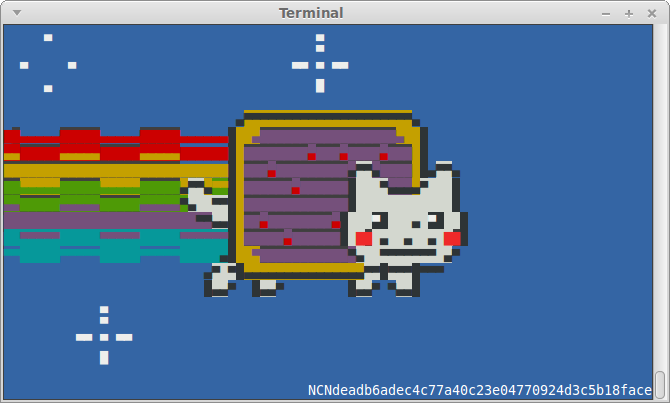 The backdoor located at "/bin/nc" is a simple bash script that checks the MD5 from "/etc/profile" and draws a Nyan Cat along with the challenge key. In order to get the proper key, we simply modify the file location to the relative path "./etc/banner", to avoid overlapping with the file from the original system. After running the file, we get the key NCNdeadb6adec4c77a40c23e04770924d3c5b18face. This was just too easy right? But what if we didn't have a known template for comparison? 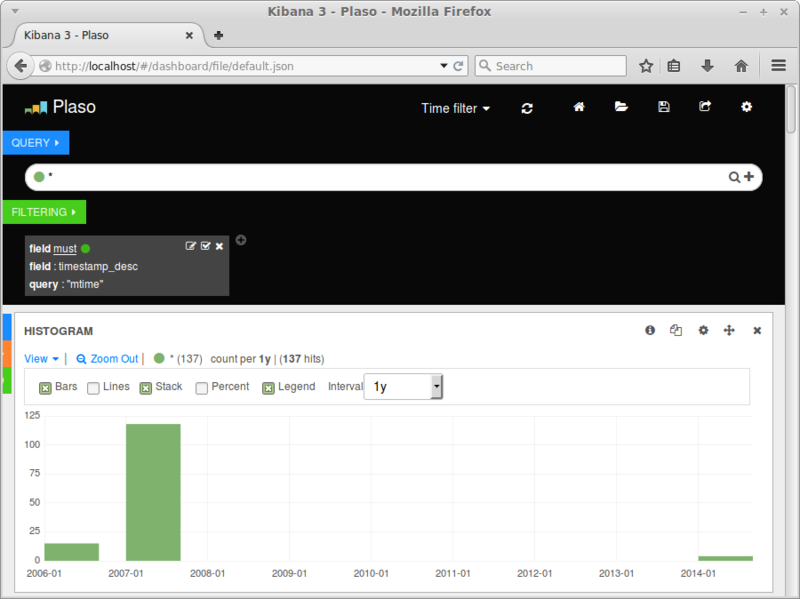 My tool of choice to perform timeline analysis is Plaso, created by @el_killerdwarf. The tool is python-based, modular and very fast. What I like most about it is the ease to output results to ELK. If you don't know about Plaso and the ELK stack, read this quick tutorial and set up your environment. 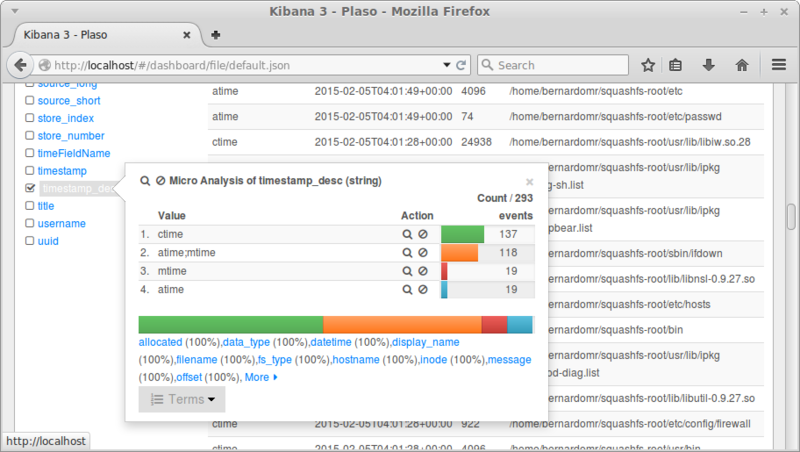 That's all, Plaso uses the filestat parser to extract metadata from the files, outputting results to Elasticsearch. First let's filter the filesystem attributes: we just want to display the mtime (modified) timestamp, so we are going to perform a micro analysis to include the value. 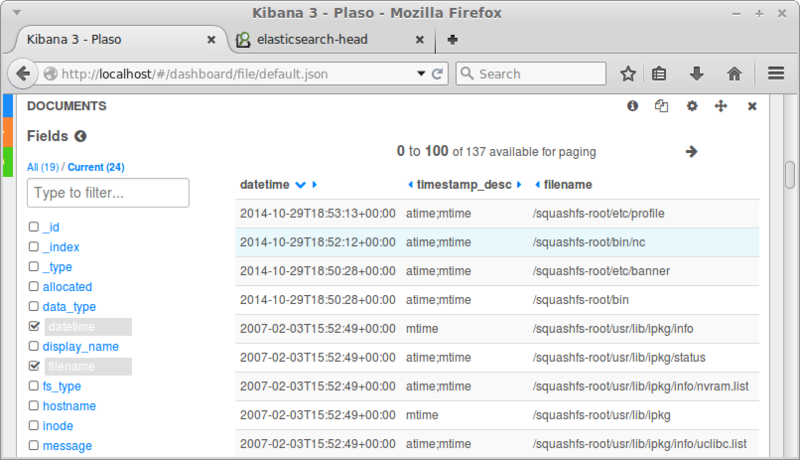 The filter should be something like this: field must | field timestamp_desc | query: "mtime". We can clearly see that the files included/modified on 2014-10-29 had a malicious nature. The state sponsored attacker did not modify other files from the OpenWRT base image. At this point it is pretty clear that the firmware was modified using the OpenWRT Image Builder, which is a pre-compiled OpenWrt build environment. 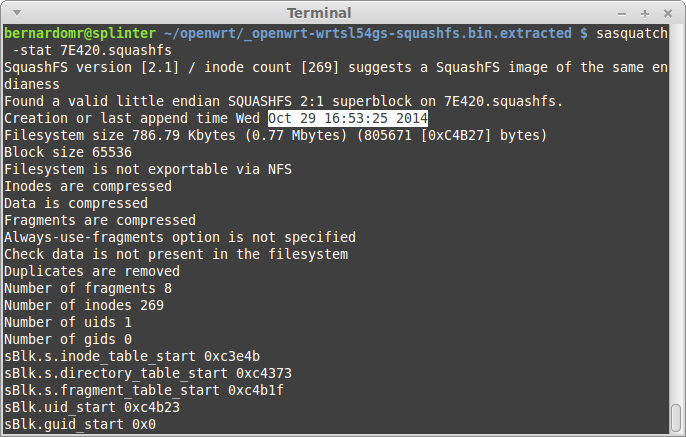 The BinHeader and the Kernel timestamps were left untouched and the only partition modified was the SquashFS one. Of course these timestamps, like any kind of metadata, could be tampered by the malicious hacker. However, they are very helpful during the initial phases, speeding up investigations and narrowing the analysis to a smaller set of data. I always get impressed when AV vendors manage to profile APT and State-sponsored attackers based on PE timestamps. Techniques like the imphash are generally used exclusively on Windows. PE Imports are the functions that a piece of software calls from other files (typically DLLs). To track these imports, a hash is created based on library/API names and their specific order within the executable. Because of the way a PE’s import table is generated, we can use the imphash value to identify related malware samples, for example. Everybody does that for Windows binaries but what about Linux? Virustotal recently included detailed ELF information on their engine. We can also use these sections to identify useful information from the binaries, including the toolchain used to compile them. When an executable is produced from source code, there are two stages - compilation and linking. Compiling takes a source file and produces an object file. Linking concatenates these object files into a single executable. The concatenation occurs by section. For example, the .comment section for the final executable will contain the contents of the .comment section of each object file that was linked into the executable. It's pretty simple to read and parse the .comment sections from ELF files. 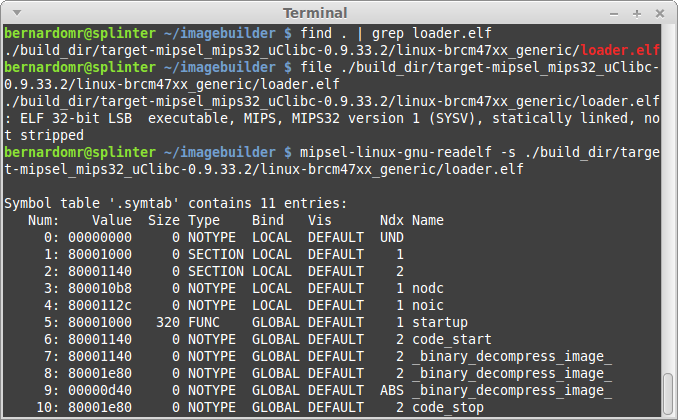 GNU readelf (part of binutils) and pyelftools include all the necessary functions parse them. I always try to display information from object files using different toolchains in order to find out which one understands the file structure properly. On this specific case, I'm going to use mipsel-linux-gnu-readelf (part of Emdebian toolchain), but the regular readelf also does the job. TheMoon Worm exploited a command injection to infect Linksys wireless routers with a self-replicating malware. If we analyze its .comment section, we can see that it was probably compiled and linked using GCC 4.2.4 and 3.3.2. If we search for a .comment section on the router E4200, targeted by the worm, we can't find any reference because the toolchain stripped all of them. Having a file compiled with a different toolchain or containing extra ELF sections (that others files don't) is something highly suspicious. For more information regarding the ELF file structure, check the ELF man and the Chapter 5 from Malware Forensics Field Guide for Linux Systems. Diffing the content from previous firmwares may be useful to find out when backdoors were first installed, modified and/or removed. Artifact timeline creation and analysis also helps to speed up investigations by correlating the vast amount of information found on system. The contents from the ELF section will likely reveal the toolchain and the compiler version used to compile a suspect executable. Clues such as this are attribution identifiers, contributing towards identifying the platform used by the attacker to craft his code. 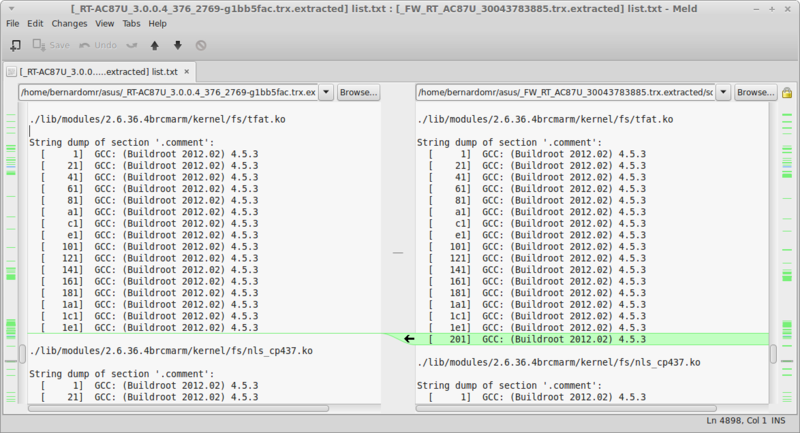 We can use the timestamps from the kernel partition to correlate different firmwares from the same family, for example. 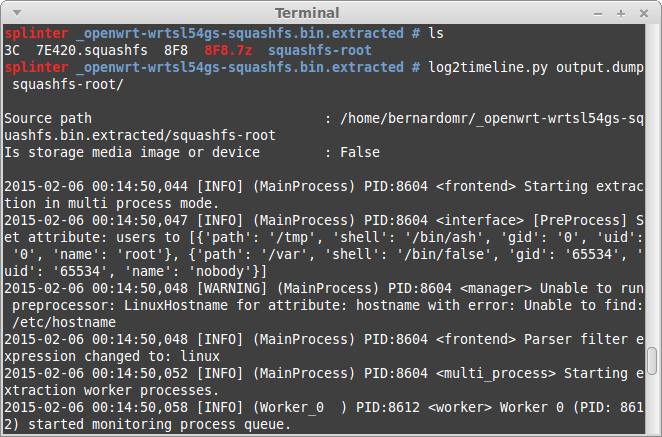 We can also compare the timestamps from each partition to find deviations: a firmware header created on 2007, with a Kernel timestamp from 2007 and a SquashFS partition dated to 2014 is highly suspicious. The Firmware.RE project is performing a large scale analysis, providing a better understanding of the security issues related to firmwares. A broader view on firmwares is not only beneficial, but necessary to discover new vulnerabilities and backdoors, correlating different device families and showing how vulnerabilities reappear across different products. This is a really cool project to track how firmwares are evolving and getting security fixes. How to use gunzip to decompress 3C file ? I used mipsb processor in IDA to open this file but IDA couldn't decode the instructions. What is the correct processor type of this ?